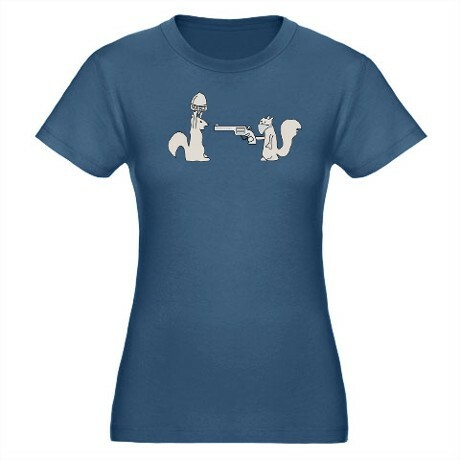 This cute squirrel cartoon shirt shows one squirrel robbing the other of his acorn. This is a humorous take on a human situation. But it's also one that squirrels are not divorced from: Squirrels stealing from each other's stored food caches is quite common. Because of this, when squirrels bury acorns and other nuts they collected, they also dig several "dummy" holes that are empty to throw off potential squirrel thieves to the location of the real goods. The shirt is available with the squirrel cartoons in black & white or color, and with and without a text bubble that reads "Give Me Your Nut!" See links above to find the appropriate designs.